This is the fun season in Virginia between Winter & Spring. Yes, I meant to say season. It’s a four week period where every day is up in the air. One day we’ve got balmy temps and Spring sunshine and maybe even a slight breeze. The very next day, we’ve got frozen dreary abysmal days where you’ve got to totally bundle up just to brave the day. Each day is a total guessing game, without any precedent. It’s like winning, or losing, the forecast lottery every morning when you wake up. Some days, it’s super annoying. 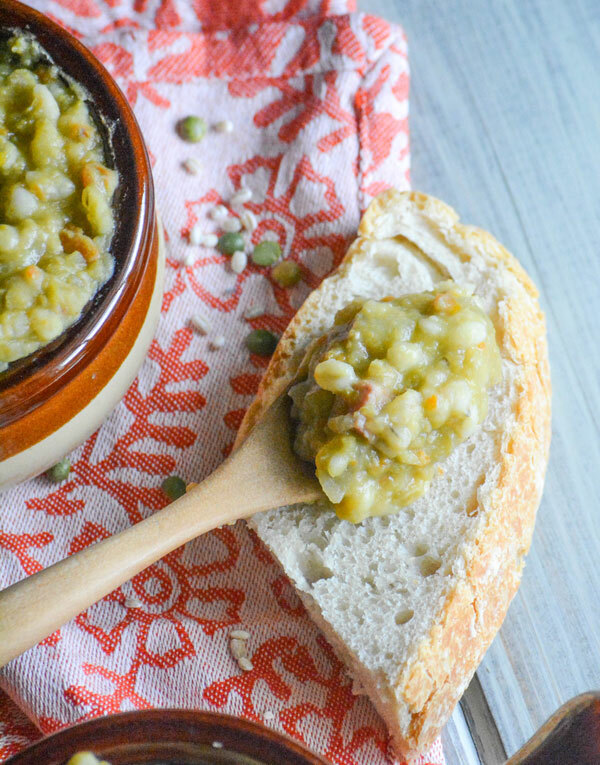 Which is why, even on the tail end of Winter when it may be a comfortable 70 degrees out with a refreshing shower, we’ve still got a batch of this uber yummy Slow Cooker Split Pea Ham & Barley Soup going. Because while today might be comfy, tomorrow it’s not even supposed to reach 60 degrees out. 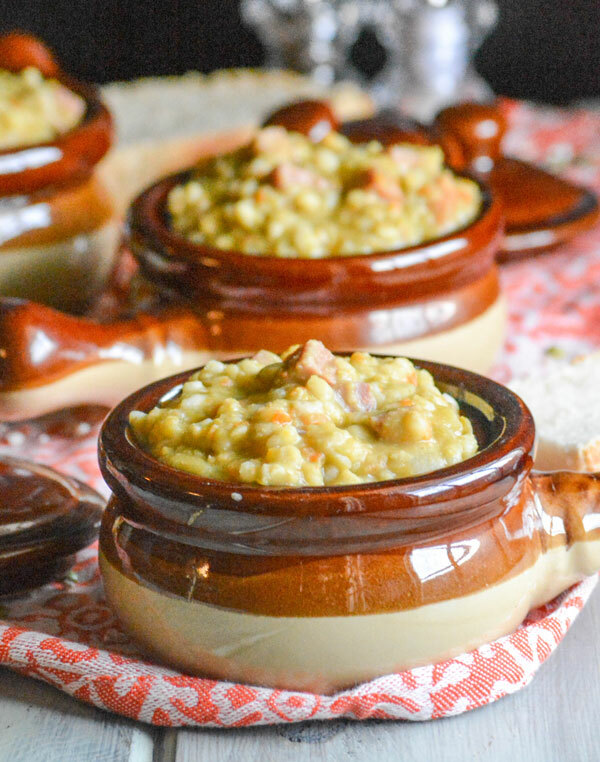 There’s never a wrong time of year for soup for me, or in our home. Still, at this time of year it’s very much a mandatory comfort dish. 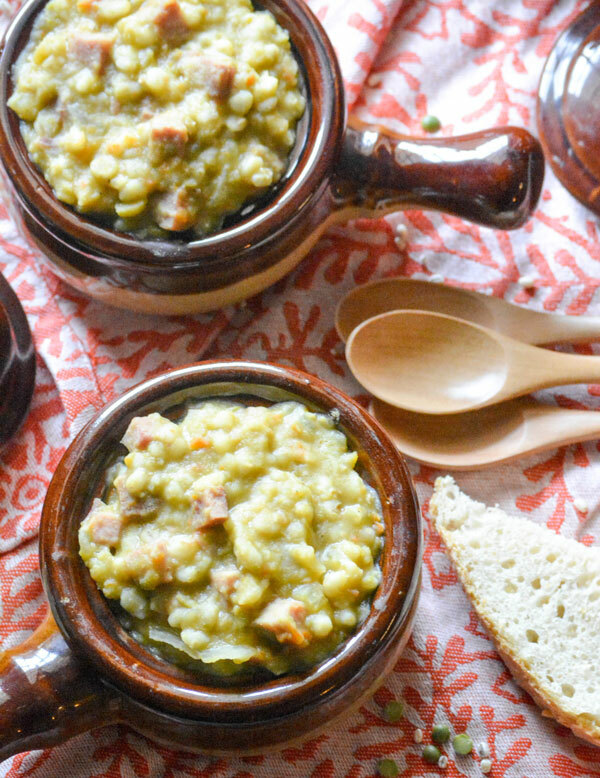 A thick & creamy hearty soup made up of green split peas, pearl barley, and broth with chopped chunks of savory ham this Slow Cooker Split Pea Ham & Barley Soup is the quintessential comfort food. It’s got this Southern gal’s Mama & Grandmama’s seal of approval. Even my boys dig into every bowl, even knowing it’s full of healthy veggies. Most of the time, they even come back for seconds! I’m not gonna lie, I adore it- especially considering it’s super quick to get ready. I’m talking maybe 5 minutes to layer everything in the crock pot, pour in the liquid, seal the lid, set it and forget it until supper time. 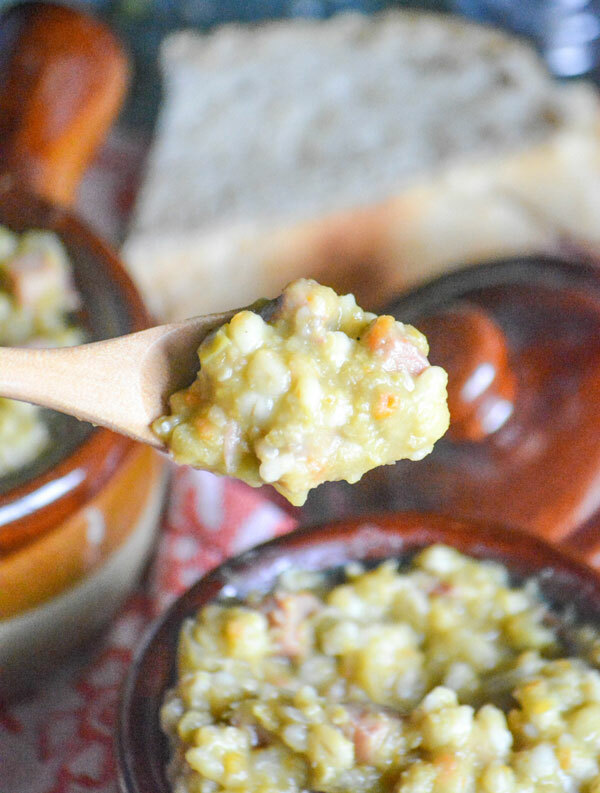 Remove the bay leaves, give it a good stir and watch the magic as everything comes together combining into an amazingly delicious cold weather soup. 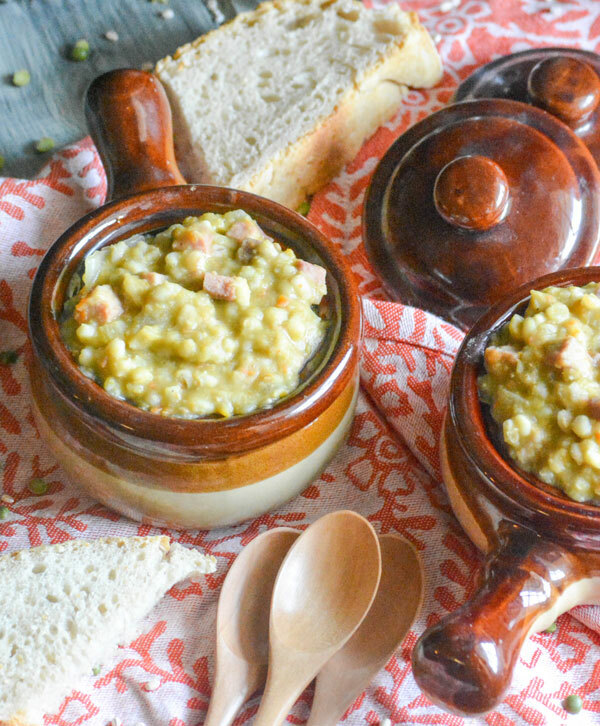 A thick & creamy healthy split pea soup that's chock full of hidden veggies with chopped ham and bits of barley- it's quick & easy and simple, thanks to cooking in the slow cooker. 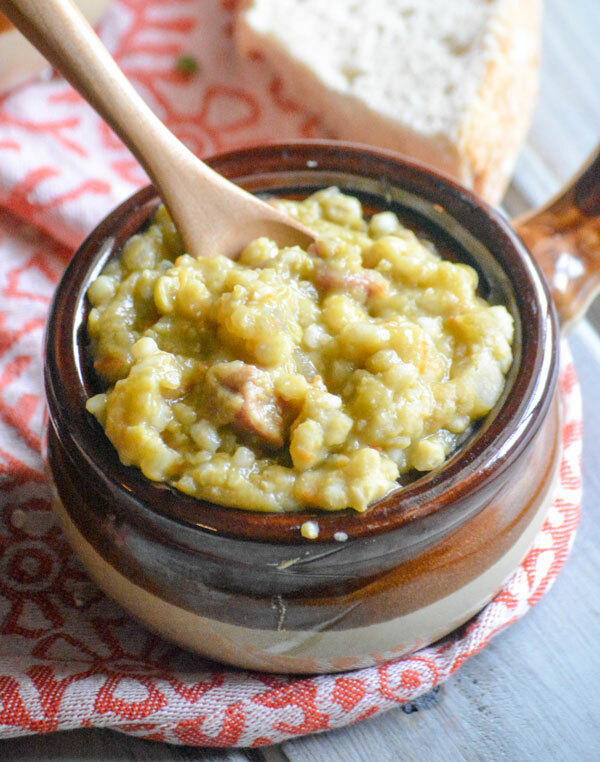 In the bowl of a full size slow cooker, layer the peas, barley, ham, carrots, onion and celery- in that order, and do not stir or combine. In a large mixing bowl, stir together the broth, water, and spicing until evenly combined. Slowly pour the mixture into the slow cooker, without disturbing the layers. Stick in the bay leaf. 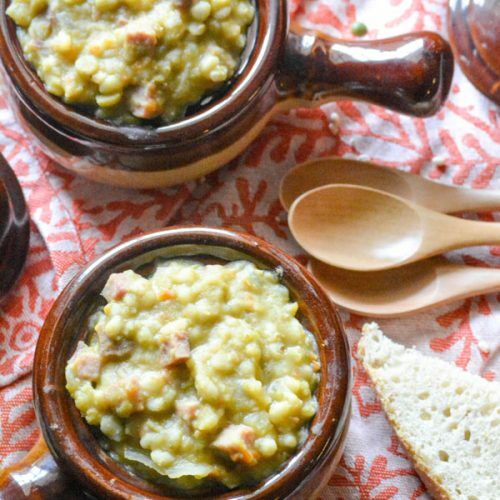 Cover the slow cooker to seal and cook on high for 4-5 hours, or on low heat for 7-8, or until the peas are softened & creamy. Remove the bay leaf, and stir the soup together until thick, creamy, and evenly combined. Salt & pepper, to taste. 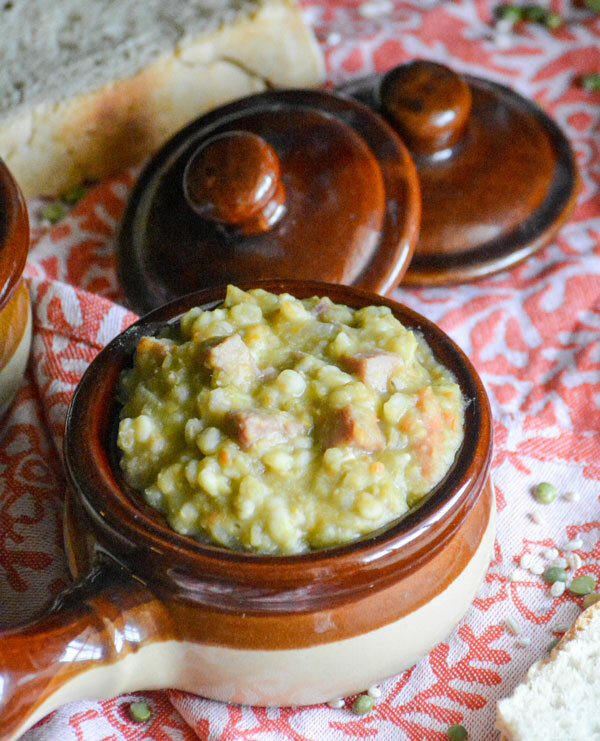 Serve immediately with crusty bread or crackers, if desired.